Waypoint founders, passionate sailing professionals, came to idea to start their own company after years of experience in charter business. At the very beginning, Waypoint 6 boats were based in Rovinj and within years by following increased interest of satisfied clients, they decided to expand on Middle Adriatic, in very charming historic town Trogir. In years, Waypoint was enlarging their fleet and improving service, but at the same time always keeping high level of quality. As they recognized market demands and client desires, they have founded a new base in worldwide well-known town Dubrovnik, giving them the possibility to explore stunning sailing destinations of South Adriatic. Nowadays, Waypoint fleet consists of 45 sailing boats and catamarans in a range of 32-53 feet, and every year is renewed with new models. They offer variety of the sailing boats (Bavaria, Dufour, Jeanneau, Beneteau, Oceanis, Elan) and catamarans (Lagoon, Privilege, Nautitech), so every client can find a boat that suits him best, whether he is looking for a brand new boat or an older, but very well maintained boat that will fit his budget. For less experienced sailors and those who prefer carefree holiday, Waypoint team offers crewed charter with skilled professional staff that will pay personal attention to each customer and make their experience unforgettable. Since the client safety and comfort comes first, every offer also includes 24 hour technical support free of charge. By having own offices and staff in Trogir and Dubrovnik base, Waypoint offers unique one-way route that connects middle and south part of the stunning Croatian Adriatic coast, with a possibility of sailing to Montenegro. Depending on availability, special one way charters are often offered without additional charges. As one of the rare companies which are offering possibility to book one-way charter, they are an excellent choice for those who prefer to explore as many places as possible during their sailing trip. Managing such a large fleet requires a powerful and reliable system to simplify everyday work and automate booking process. As a Booking Manager loyal client since 2012, they have been using advanced System features in order to track financial performance of each yacht and to get a clear overview of cooperation results with specific agency. 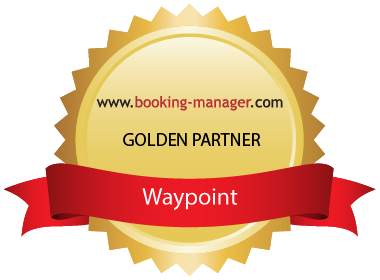 Waypoint has recognized Booking Manager System as the best possible solution to effectively organize back office and increase market share of their business. As a Golden Partner they are exclusively being bookable by agencies that use the System and other connected distribution websites that brings them extra benefits. Besides additional marketing promotion which helps them reach more clients, Golden Partnership also guarantees financial security for all bookings made through the System.